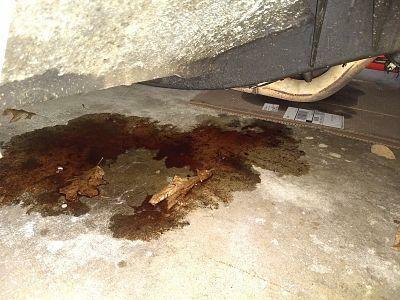 Sunday morning I was greeted by a surprise puddle of transmission fluid under the 56. It was on the passenger side, just behind the tire. The car has not moved or been started since mid-December. We had a cold spell, but I don't remember seeing the thermometer in the garage go below 40Fs. The leak seems to have stopped now. I got underneath with a light and the only droplet I could see was at the bottom of the transmission fill tube. In the 14 years I've had this car, this is the first time I've seen this. Is this a somewhat normal thing or is it something I should be concerned about and look toward fixing? After it sits a couple weeks, if you crank it up, move it a little, then shut it off, the fluid will come burping up that fill tube. If you are not working it hard, you can run it a little low on fluid to prevent that happening. Thanks for the replies. I'm glad it doesn't sound like anything major. You may want to try this. "Burping" is common, this kit is supposed to fix the problem. Mine has been burping for years with that valve installed. Interesting, yet another "fix" that doesn't work. Back in the '60s, I had a 55 convertible and then a 57 hardtop. Both powerglides and no strange leaks. Guess I was lucky. If you drive them daily, or at least once a week you should not have that problem. My 55 sits way to long between drives and it burps fluid. Yes, both daily drivers. If we only knew then what we know now! If the engine was not started and the puddle appeared it is not burping. The fluid in the top half of he converter drains down and over fills the sump. Then the fluid leaks out around the kick-down lever seal because the fluid is way over full. Converter will refill when engine is running and takes about three minutes. Thanks Gene. After seeing a second, or continuing, puddle after wiping up the first one, this makes sense. I would think the burping would be a one time thing. I'll look closer for signs of the source and start the car to let it run for a while.